Remove the air cleaner assembly and depress the throttle twice. The first throttle press is to set the choke plate, and the second is to give the motor a shot of fuel. The choke blade should be completely closed at this point. Start the vehicle. The choke blade should pop open approx. 1/8″. There is a either a rod to bend or a screw to turn to adjust that opening. Check your carburetor manual or guide to find that rod or screw. If the motor runs rough, manually open or close the choke blade a little bit — whichever way improves the running, adjust accordingly. If the choke blade is closed too much, the vehicle will run rich and usually have black smoke coming from the exhaust pipe. Hence you will need to adjust the rod or screw to OPEN the blade a little more. Open the blade too much and it will run lean and stall. Hence you will need to close the blade a little more. After you have set the choke and achieved the desired initial choke opening on start up, you need to adjust the fast idle speed. This is separate from the curb idle speed. Again, there is usually a separate screw for this. On GM Quadrajets it is underneath the choke assembly. On Holley 4bbls it is usually behind the choke housing. 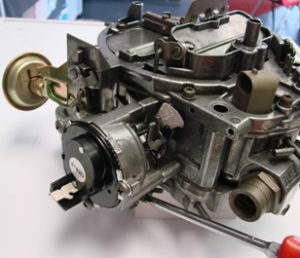 On 1 and 2bbl model carbs it is usually related to a fast idle cam on the throttle side of the carburetor. Refer to your carburetor manufacturer’s model. On start up, Setting An Automatic Choke, adjust fast idle speed to manufacturers specifications(usually found on a sticker in the engine compartment). If you cannot find your specs, 1800 rpm is a safe speed to set it at. Wait for about 3 minutes and your choke blade should be completely open (blade straight up and down). If it is not, check the hot air tube to see if it is hot(blazing hot to the touch), or if it is electric, make sure there is 12 volts at the choke wire and there is a good ground.